As a follow on to the successful Millet Value Chain Project, which increased millet yields by 68 percent and sales revenues by 145 percent, NCBA CLUSA’s Millet Business Services project focuses on post harvest handling, building the capacity of producer organizations to access markets and add value to their crop. MBSP also builds private sector extension services for agricultural training, currently in short supply in Senegal. Malik Mbaye with his two tons of millet harvest after applying a technical calendar he learned in training. NCBA CLUSA also assists in advertising locally produced millet on the Senegalese marketplace as an alternative to imported rice and other grains. Expand trade of millet by developing public-private relationships, facilitating trade relationships, researching export opportunities, building agricultural extension capacity, and promoting food safety issues and requirements. Local packaging has won awards for sustainability and is increasing sales of millet. 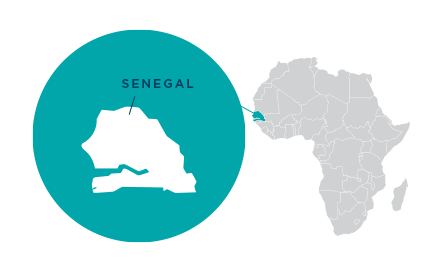 Each year, Senegal’s Ministry of Women, Family and Gender organizes a prize for the most innovative projects led by women. 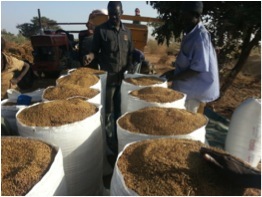 Organized throughout Senegal’s 14 regions, the 2017 first place prize for the Fatick region was awarded to the Local Grain Processors Union (UTRACEL), which, with support from the USDA funded Millet Business Services Project, is changing how millet is processed, packaged and sold in the region and around Senegal. Not only is the work changing the buying power and market for a local product, but the local packaging group is providing jobs and livelihoods for women around the region. The group also came in 8th overall in Senegal out of hundreds of entries. Micro and small businesses in the millet processing industry were having a hard time accessing quality packaging because of their expensive costs. To increase local marketing and cut down on packaging costs, the Millet Business Services Project, which NCBA CLUSA implements in Senegal, began training the processing centers, groups comprised usually entirely of women, in local packaging techniques. Today, the project has supported the installation of five packaging units, including two in Dakar, the capital. Each unit employs six to seven people, mostly youth, as Packaging Service Providers. Using kraft butcher paper, which is made locally, these packaging centers not only reduce plastic waste (a key goal in Senegal’s environmental policy), but also support the burgeoning local paper industry – there are 181 kraft paper processing companies supported by the project as well. The symbiotic relationship between the paper providers and packagers is helping to boost livelihoods along the millet value chain from farm to supermarket. Professional local packing has contributed to increased sales as well as better marketing for agribusiness producer groups. 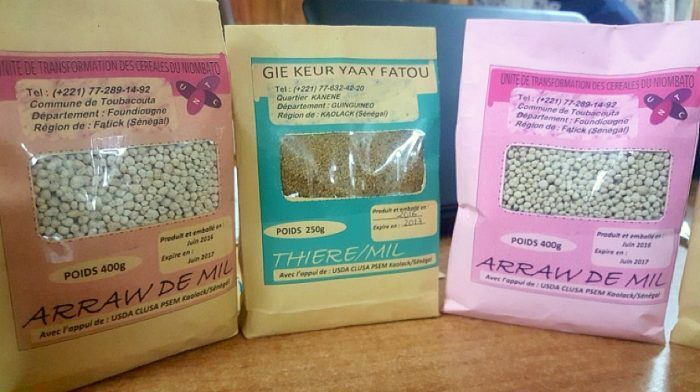 Processed millet and packaged products are marketed mainly in Dakar, Thiès, Touba, as well as in the four regional intervention areas of the project and outside the zones of intervention. There are also plans to expand into international markets, including exhibitions at the Paris International Agriculture Show (SIA).